Thank you for your interest in jumping with No Limits Skydiving™. Our skydiving center is the most first-time-jumper-friendly program in the U.S. We combine excellent staff, state of the art equipment, and great facilities for the best skydiving experience in Virginia and North Carolina. At No Limits Skydiving™, we believe that the future of skydiving is in you: the future skydiver… so, that’s who we put our focus, money, and energy on. Our drop zone locations are centered in between the city of Richmond and Virginia Beach. Come and be a part of this exhilarating sport! When that airplane door opens, there is a moment when you look down and think, “What am I doing here?” What you are doing is living life! There are so many quotes about living in the moment, and making sure you don’t let life pass you by, and too many people who are afraid to step out of the box. 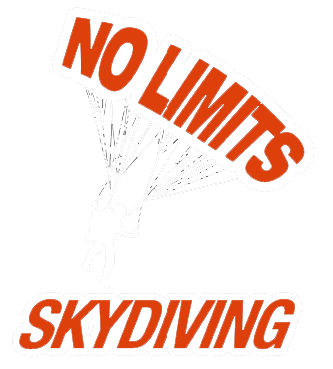 At No Limits Skydiving™, we believe that in order to get anything incredible out of life, you have to be willing to try new things. Skydiving is a real eye-opener. It will make you live for the moment. There is nothing that will better show you what is really important in life, than free falling at 120 mph. Once you arrive for your appointment, we will have you fill some paperwork. After paperwork is completed, you will sit through a short training session that will last about 15 minutes. 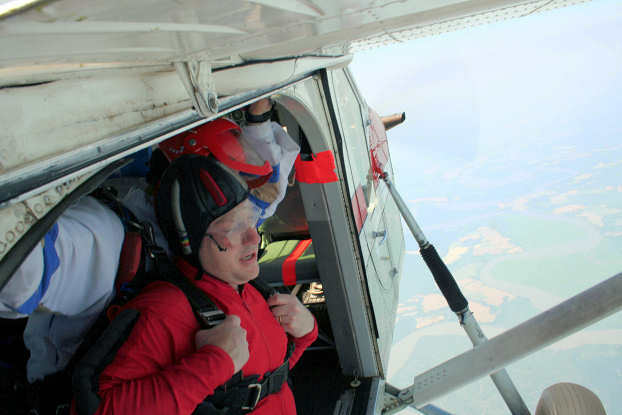 Your training will consist of us showing you what is going to happen during your tandem skydive. You will learn about our safety precautions, techniques, and that your only real job is to keep your eyes open and relax… that’s right, relax. After we show you what is going to happen during your jump, we will put you in a jumpsuit, harness, helmet, and goggles. We will then meet the airplane and take a 20 minute ride to a safe jumping altitude. We encourage you to enjoy the view on the ride up. The views from both of our locations are definitely worth taking in. 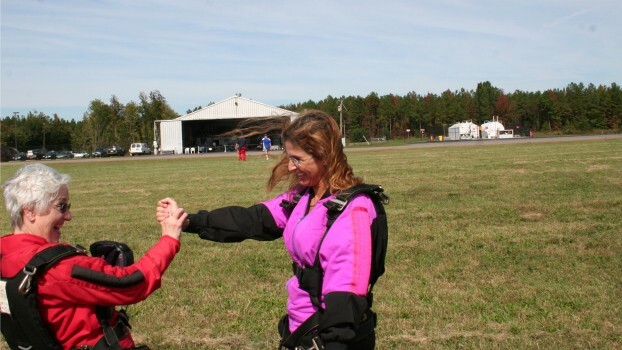 Once attached to your instructor, you will exit the aircraft and free fall for approximately one minute. At 5,000 feet, your instructor will deploy the parachute for 5 minutes of floating under the parachute. There is a big difference between free falling and being under the canopy. The free fall is very adrenaline filled, with the wind rushing past you, while the parachute ride is incredibly peaceful. Everything around you becomes very tranquil and serene. It’s like a peanut butter and jelly sandwich- two very different things that make for one wonderful experience. Your instructor will guide both of you down, maneuvering the parachute for a soft landing back at the airport. After you land, we will gather all of our gear and head back to the office. Once we are back at the office, we will get you out of your gear. In the summertime, we’ll even provide you with a free popsicle. We figured that every adventurer deserves a treat. You will leave that day with your first Jump Certificate and your video, if you decided to purchase one. More importantly, you will leave knowing you are part of the skydiving community at No Limits Skydiving™. When the airplane door opens, there is a lot going on. Some people get a sensory overload with clouds whizzing past and the wind rushing through your hair- so it’s difficult to remember everything that happens. With the video, you can relive the experience again and again. The best part of the video is the jumpers’ facial expressions as the door opens. We videotape your free fall from the plane ride to the landing. We even record your feet dangling under the parachute. Make sure you bring your family and friends to join you on your skydive, or just to watch. They’ll be able to stand on the ground below you to watch you land. After your tandem skydive, we will have your video completed in about 15 minutes. This way when you are back home after vacation, you can enjoy watching your skydive over and over.